Kleefeld on Comics: On History: No Reprint Love for Outcault? But it just occurred to me that we really don't have anything focusing on Richard Outcault. He created both The Yellow Kid as well as Buster Brown, and while neither had quite the longevity of some other comics, and argueably don't have the historical pedigree that is sometimes touted, their popularity at the time of publication make them both note-worthy. Superman wasn't Jerry Siegel and Joe Shuster's first character, after all, nor was it their first published comics work. But the character's broad and rapid popularity make it a subject of great study. So, too, are the Yellow Kid and Buster Brown. But, strangely, there's relatively little about them. The Yellow Kid has been written about extensively, certainly, and most of those pieces seem to include a number of reprints, but I don't see where anyone's really try to put togther a single Yellow Kid reprint collection. And while Buster Brown seems to have gotten the reprint treatment more than a few times over the decades, they seem decidedly finite in nature. This collection from 2009, for example, is only 60 pages long and this one from 2012 is only 76. Hardly a good representation of the nearly two decades of strips. Does it have something to do with a rights issue? I can't imagine it would since copyrights for anything prior to 1923 have expired. 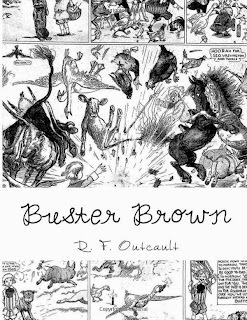 (Buster Brown ceased publication in 1921.) Access to materials? I'm sure the original art is no longer around, but that hardly stopped any of the other publications. So what's the deal, publishers? No one willing to take on Outcault's work? Seems to me there's a decent audience for this out there. What's holding you back? "Seems to me there's a decent audience for this out there." Depends on what you define as a "decent audience". With the majority of Marvel and DC books averaging under 25,000 per issue print runs, the costs of searching, compiling and remastering even PD material from almost a century ago (with rare exceptions like Little Nemo) are prohibitive. I'm sure publishers like Fantagraphics and Yoe have considered doing such projects, and found them not viable. Actually, there IS (or was) a very good Yellow Kid book published in 1995 by Kitchen Sink. It has loads of colour, and has 300 pages. At 9x12, it could be bigger, but it's not tiny anyway. It's available on the web from many used book dealers. I think if ever there will be a time when somewhat arcane reprint books can thrive, this is it. I've been seeking any and all copies and reprints of the earliest comic strips for almost sixty years, and this is a bonanza age. I've longed for this material, and now it's coming thick and fast. I'm having trouble keeping up. In fact, I'm falling behind. So I hope we can see even more such collections — of Outcault but also Opper, Dirks, Swinnerton, early Herriman, and many more. Bring 'em on!